The ultimate party bus experience! 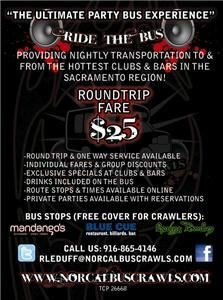 We provide nightly transportation to and from all the hottest clubs and bars in the Sacramento region. We offer individual round trip fares starting at $25.00 including drinks on the bus. We also have an extensive relationship with all the hot spots giving you exclusive specials. Most clubs offer no cover charge to any of our club hoppers, with a VIP wrist band. In addition to club hopping we offer luxury VIP service to: Red Hawk Casino,Thunder Valley Casino, Restaurants, Sacramento Kings games, Sacramento Convention Center, as well as Amador wine tours, Napa Wine tours, El Dorado Wine tours, Lodi wine tours, birthdays, and any other special occasion to celebrate.